The hottest places in Hell are reserved for those who, in time of great moral crises, retained their neutrality. The purpose of the whole (work) is to remove those who are living in this life from a state of wretchedness and lead them to the state of blessedness. I made my own house be my gallows. 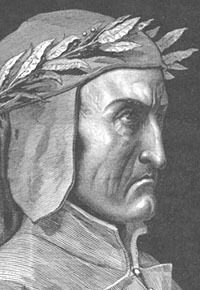 Dante Alighieri was a Florentine poet. His greatest work, The Divine Comedy, is considered the greatest literary statement produced in Europe in the medieval period, and the basis of the modern Italian language. The essence of Dante's philosophy is that all virtues and all vices proceed from love. Dante may be said to have made Italian poetry, and to have stamped the mark of his lofty and commanding personality upon all modern literature. Dante was born in circa May 29, 1265 – died, September 14, 1321. He says he was born under the sign of Gemini, placing his birthday in May or June. His own statement in the "Paradiso" (xxii, 112-117) that he was born when the sun was in Gemini, fixes his birthday between 18 May and 17 June. 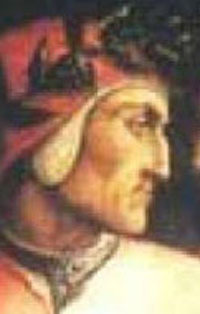 He was born into the prominent Alighieri family of Florence, and Dante asserted his family descended from the ancient Romans (but the earliest relative he can mention by name is of no earlier a date than about 1100). Dante's mother died when Dante was 5 or 6 years old, and his father soon married, or at least bore two children, Dante's half-brother Francesco and sister Tana (Gaetana). Not much is known about Dante's education, and it is presumed he studied at home. We know he studied Tuscan poetry, His interests brought him to discover Provençal minstrels and poets, and Latin culture (with an obvious particular devotion to Virgil). When 18, he met others and with them became leaders of Dolce Stil Nuovo (The Sweet New Style). When he was nine years old he met Beatrice Portinari, the daughter of Folco Portinari, with whom he fell in love "at first sight", and apparently without even having spoken to her. He saw her frequently after age 18, often exchanging greetings in the street, but he never knew her well. It is hard to decipher of what this love consisted, but something extremely important for Italian culture was happening: as it is in the sign of this love that Dante gave his imprint to the Stil Novo and would lead poets and writers to discover the themes of Love (Amore), which had never been so emphasized before. Love for Beatrice (as in a different manner Petrarca would show for his Laura) would apparently be the reason for poetry and for living, together with political passions. After the death of Beatrice in 1290, he plunged into intense study of classical philosophy and Provençal poetry. This woman, thought to have been Beatrice Portinari, was Dante’s acknowledged source of spiritual inspiration. A few years before his exile Dante had married Gemma di Manetto Donati, a distant kinswoman of Corso, by whom he had four children. He never saw his wife again; but his sons, Pietro and Jacopo, and one of his daughters, Beatrice, joined him in later years. At first, he made common cause with his fellow-exiles at Siena, Arezzo, and Forli, in attempting to win his way back to Florence with the aid of Ghibelline arms. 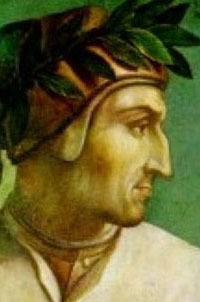 Dante's name occurs in a document of 8 June, 1302 among the exiled Bianchi who at San Godenzo in the Apennines were forming an alliance with the Ubaldini to make war upon the Florentine Republic; but, in a similar agreement signed at Bologna on 18 June, 1303, he no longer appears among them. 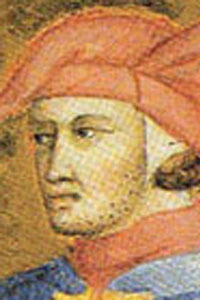 Between these two dates he had made his resolution to form a party by himself (Par., xvii, 61-68), and had sought refuge in the hospitality of Bartolommeo della Scala, the lord of Verona, where he first saw Can Grande della Scala, Bartolommeo's younger brother, then a boy of fourteen years, who became the hero of his later days. Dante now withdrew from all active participation in politics. Dante’s reputation as the outstanding figure of Italian letters rests mainly on the Divine Comedy, a long vernacular poem in 100 cantos (more than 14,000 lines) composed during his exile. Dante entitled it Commedia; the adjective Divina was added in the 16th cent. It recounts the tale of the poet’s journey through Hell, Purgatory, and Heaven, and is divided accordingly into three parts. 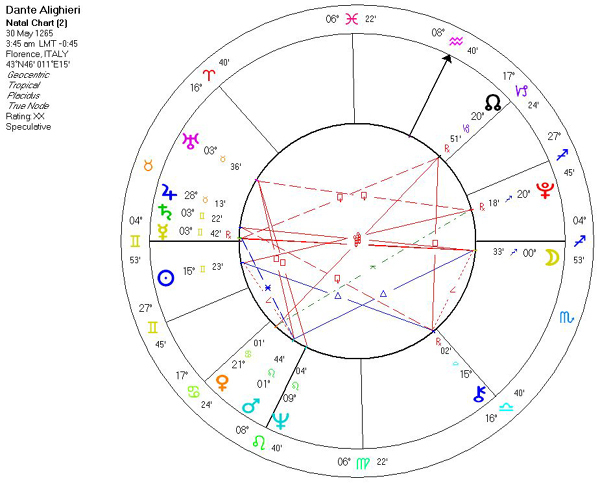 The strong Saturnian nose and look of severity may be shown in his Saturn conjunct Mercury on the Gemini Ascendant.